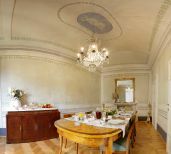 The B & B Santa Caterina D'Alessandria is located in a historic building in the heart of the historic center of Pisa, 500 meters from Piazza dei Miracoli(Torre di Pisa). The windows of the residence overlooking the Chiesa di Santa Caterina di Alessandria characterized by a dualism that has architectural features of Romanesque and Gothic trim. Just outside the residence you can walk among the trees of the Martyrs of Liberty Square and then take a coffee in Borgo Stretto where an ancient pastry will brighten your palate with delicious pastries. Other "two steps" and you will be on the "Ponte di Mezzo" crossing the river Arno, and which brings in its waters art and the great history of Tuscany , a look to the right and after the Museo Palazzo Blu you will see the fantastic Della Spina Church called one of the finest examples of Gothic architecture in Europe . Crossing the bridge you will arrive at the foot of the Town Hall with its distinctive portico where, at certain times of the year you can find culinary and cultural events or the small Christmas market. Continuing your walk to Corso Italian encounter fabulous shops for shopping. With a meticulous search and recovery lasted a year, we have brought to light the ancient frescoes and decorations of 700, found throughout the residence. Enter the B & B Santa Caterina D 'Alexandria is a unique experience that takes you into a corner intimate and private, surrounded by HISTORY! Each room is equipped with double glazing, air conditioning, mini bar, private bathroom with shower and hairdryer, bed linen and towels. Upon your arrival you will be given a set of keys to access the Bed and Breakfast and your room at any time and in complete independence. Besides a lively nightlife among the many cafes of the historic center, Pisa offers the opportunity to participate in cultural events very important, organized by the Teatro Verdi or Palace Museum or the Blue City of Pisa during the "Giugno Pisano", promotes musical events and tradition of walking around the city, one of this is the feast of St. Ranieri, Patron of the town, which is organized on the occasion of the feature "Luminara"